At 6:00 AM on Wednesday, July 4th, I caught the ditty bags trying to make a break for freedom. I was on my way to the studio to turn on the heat, and if I had been much later, they would have been gone. I heard them whispering the other night, but when I walked over to where they were hanging by clothespins, they stopped…appeared as simple constructions of leftover cloth and vintage buttons. I knew something was up. I didn’t, however, expect them to attempt escape. We sat and had a conversation and they told me that they wanted lives of their own. They wanted usefulness. I granted them their wish and they are now living on my Etsy site here. Please pay them a visit. Creative energy that becomes manifest in things wants to keep moving. Half finished projects and ideas are energy leaks in the art system. Completion is the key to system management and the ditty bag rebellion was my wakeup. Once my creations are done, there is one more step: marketing. Then on to the next project! Do you have unfinished projects that are draining your creative pool? 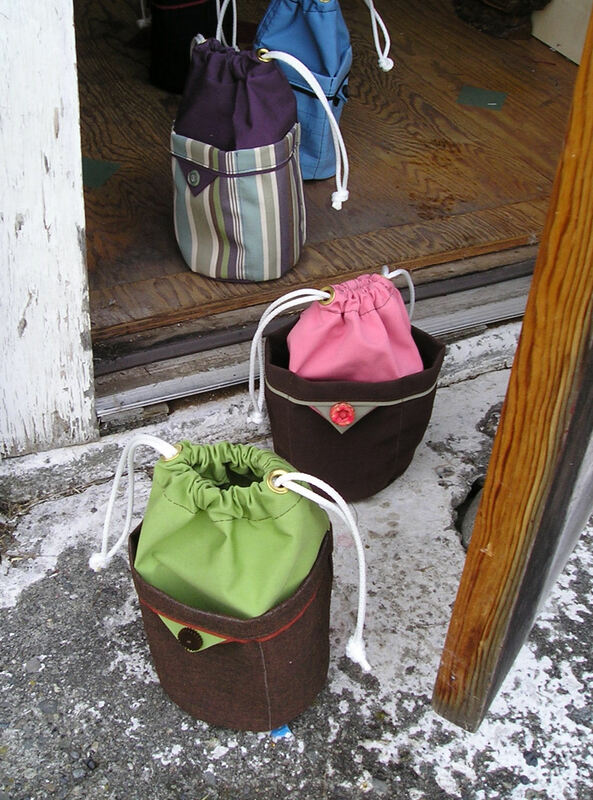 those rebellious little bags are Gorgeous!!! Turned on your heat! It’s July! Oh well, let me adjust my ac thermostat… I love your bags! Good luck! Will check you out on etsy! Yeah… heat on in July. Well, it’s the Northwest…I think summer might be here today though. What a wonderful piece of humor and creative marketing move. Nice bags. I know they will do well.